A view of the elevated road. The Jahra Road Development Project in Kuwait has achieved major advancements with the latest milestone being the opening of the Fourth Ring Road last month. Commenced in 2010, the project is considered to be one of the largest single infrastructure projects in Kuwait and in the Middle East. The project, one of the largest elevated road projects in the world, involves the construction of 17.7 km of segmental viaducts (7.3 km of mainline Jahra Road, 2.4 km of link roads and km of ramps), 0.62 km of depressed road, two interchanges and 10 pedestrian bridges. The at-grade road works include 3.4 km of mainline Jahra Road, 1 km of link roads and 15.1 km of service roads. The project also includes major utility works, such as 3.5 km of storm water box culverts, 33 km of water lines relocation, 8 km of sanitary sewer relocation, 51 km of electric cables relocation, and 12 km of communication ducts. As part of the Ministry of Public Works’ (MPW) strategic development plan to improve the transport infrastructure in Kuwait, the upgrade of the Jahra Road was integral to elevating the key routes within the country. The project is expected to transform the simple three-lane highway into a grand unified two-level motorway. MPW has enlisted the services of Louis Berger and Pace (joint venture) as project design and supervision consultants, and the Arab Contractors Company as the main contractor for this KD 264.76 million ($895.594 million) project. The construction method used for the elevated structures is precast, post-tensioned, segmental bridges. These segments are manufactured in a precast yard, constructed specifically for the Jahra Road project. The precast yard is essentially a large plant that uses moulding machines for the production of precast segments, benefiting the project by enhancing the speed of production and ensuring quality control. The 150,000-sq-m yard is located outside of the city in the Doha area, and accommodates large-scale precasting technology and equipment, such as the mould production frames, several different types of cranes, water tanks, storage facilities and the curing chambers. The process of erection of the bridge segments involves using launching gantries – the first time the state-of-the-art technology has been used in Kuwait. 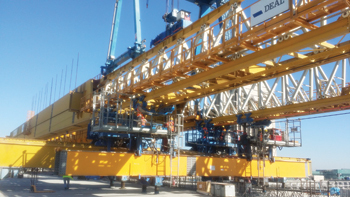 Designed specifically for the project, the launching gantry weighs nearly 500 tonnes at a length of 140 m. It is capable of lifting a bridge segment that weighs up to 120 tonnes. Currently, two launching gantries are functional on the project. 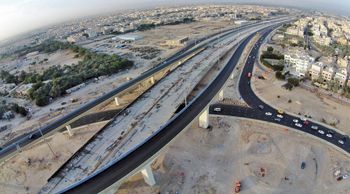 Major progress has been made on the Jahra Road Development Project. Overall, about 86 per cent of piles, 78 per cent of pile caps, 75 per cent of piers have been completed, in addition, 52 per cent of the segments have been erected and 5,827 segments have been fabricated. The road upgrade project aims to ease traffic congestion along the road, which connects the city to key residential and industrial areas, as well as hospitals, universities and government institutions.